Winter rushed in uninvited and unexpected. After one or two cold snaps in early December, the Welland Canal froze over. All ships, big and small, stood docked at the Port Dalhousie piers. Without tourists’ presence and sailors’ laughter, the port became deserted and silent. My cleaning day at Sean’s happened to fall on Christmas Eve. I called him, asking if he wanted to cancel it. He asked me to come. When I walked into his house, Sean was sitting beside the fireplace, looking at a picture album. “It’s very cold. Do you want to warm up a bit first?” he asked. The fire burned briskly, radiating an enticing warmth that I found hard to resist. However, I hesitated for just an instant and then declined with a shake of my head. “I’ve decided not to join my family for Christmas. I want to have a quiet time,” Sean said. Isn’t his life too quiet? I thought to myself. “Can you make sweet and sour chicken?” He asked with eager expectation. An hour later, I was busy cooking, deep-frying and stir-frying. Sean fussed about, but he was of little help. I made a vegetable soup and four dishes: shrimp and mango salad, chicken braised in Coke sauce, snow peas with minced garlic, and Gongbao fish filet with hot pepper and peanut. Sean and I sat down at the dining room table facing each other. He opened an aged French red wine and poured us each a glass. It swirled quietly, a suggestive scarlet red. I turned and saw snowflakes dancing among the trees. Although the TV weatherman predicted no snow for today, we were having a white Christmas after all. Xiaowen Zeng is a Canadian-Chinese author and a screenwriter. She has published three novels in China: Shattered Dreams in Texas, The Night is Still Young, and The Immigrant Years; three collections of novellas and short stories; and three collections of non-fiction. She also co-wrote and published a 20-episode TV drama Invented in China, which was made into a 30-episode series. Her works have been included in a number of literature collections in China, the US, and Canada. She has won about a dozen literature awards. This is an excerpt of a story that was originally published in Literature, No.6, 2009, and was republished in Toward the North (Inanna Publications). 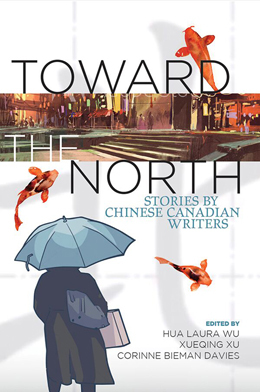 It was on the China Fiction Association’s Top 10 List for 2009.